(Newser) – Sylvester Stallone's lesser-known younger brother has finally got his moment in the public eye—but it's not for his acting or singing. Frank Stallone faced an angry backlash after he insulted Parkland school shooting survivors in now-deleted tweets Saturday, the Independent reports. Stallone called David Hogg a "p****" and said he was sure "someone from his age group is dying to sucker punch this rich little b****." "Watch him run home like the coward he is," Stallone said. "He's the worst rep for today's youth headline grabbing punk." He also targeted Emma Gonzalez, another outspoken Parkland survivor, calling her "another headline grabbing clown." "She thinks she it she ain't s***," the 67-year-old wrote. 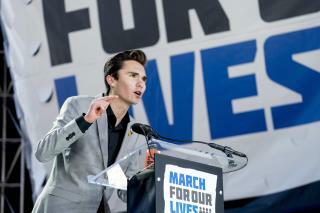 it is what bullies do this is the new face of censorship in America here he was never in school till after by his own words and claims the spotlight as a victim. It seems a Young Hogg is a bully!! It seems all the other young "Bullies has found new found fame in "Shutting down" public Debate"!!? Silence ..Of they will attack you if you criticize them? Maybe they "Snort Con***s" for fun? They gotta do something for entertainment ..it Seems!! Maybe "Bullying" Gun owners into turn in their "Weapons of Choice" is their fun? Hello Little "Dictator" if left unchecked??!! ?